The Microchip MPLAB® ICD 4 in-circuit debugger/programmer is a Programmer/Debugger for Flash PIC® Microcontrollers (MCUs) and dsPIC® Digital Signal Controllers (DSCs), as well as CEC1702 and SAM 32-bit MCUs. It offers cost-effective performance and features a simple and durable design. 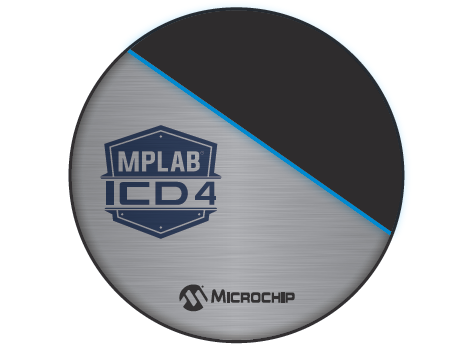 The MPLAB ICD 4 is Microchip’s fastest, cost-effective debugging and programming tool for Microchip devices. This speed is provided by a 300 MHz, 32-bit MCU with 2 MB of RAM and a high-speed FPGA to yield faster communications, downloads and debugging. It debugs and programs with the powerful, yet easy-to-use graphical user interface of MPLAB X Integrated Development Environment (IDE). The MPLAB ICD 4 is connected to your PC using a high-speed USB 2.0 interface and is connected to the target with a debugging connector which is also compatible with the MPLAB ICD 3 or MPLAB REAL ICE™ In-circuit emulator systems. The MPLAB ICD 4 also works with JTAG interfaces. Programming/debugging pins are physically isolated via relays until the voltage is determined to be safe for connection, programmable resistor value, and direction (pull-up, pull-down, or nonexistent). The MPLAB ICD 4 supports many, but not all, Microchip devices at this time. The firmware is continually being upgraded to add support for new devices. For the most current list of supported parts, review the latest release notes located in MPLAB X IDE or view them in the Supported Devices tab below. To request device support or to report issues, email: moc.pihcorcim|etadpu_4DCI#moc.pihcorcim|etadpu_4DCI.